In the fall of 2017, Philadelphia was the site of 20 temporary monuments created by local and international artists across 10 public parks as part of a citywide art and history project curated by Paul Farber and Ken Lum, and produced in partnership with Mural Arts Philadelphia. These included an afro pick embedded on the Municipal Services Plaza, a performance in a public park, a mirrored box surrounding an old monument such that it simultaneously disappeared into its surroundings and reflected the people in the park and many others. In each of 10 public squares and parks, a small, temporary lab was staffed at least 4 days a week to invite Philadelphians and visitors to reflect on our city’s monuments. They were handed a clipboard and asked to engage with the central guiding question of Monument Lab: What is an appropriate monument for the current city of Philadelphia? Nearly 5000 people offered proposals in answer to that question, and each of their answers has been transcribed, analyzed, including a drawing or description, proposers’ home zip codes, proposers’ ages, and the place in the city where they’d like to see their imagined monuments. This dataset, comprising an imagined version of the city’s monumental landscape will be focus of a conversation about the intersections between the stories that are told in our public monuments and in our data, and the individual stories that are lost and hidden. See below for a Sutori recap of this Digital Dialogue, including live tweets and select resources referenced by Allen during her talk. 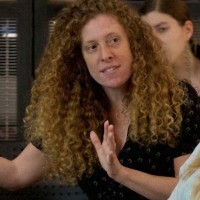 Laurie Allen is the Director for Digital Scholarship at the University of Pennsylvania Libraries. She and her colleagues collaborate on new forms of scholarship to support campus-wide open access publishing, data curation & management, digital humanities, and mapping and geospatial data efforts. A native Philadelphia, she also serves as Research Director for Monument Lab, a public art and civic research project in Philadelphia. In late 2016, Allen and colleagues in the Penn Libraries helped start Data Refuge by teaming up with the Penn Program in Environmental Humanities in an effort to help protect copies of federal environmental and climate data. Before joining the Penn Libraries, Laurie was the Coordinator for Digital Scholarship and Research at Haverford College. She holds a Bachelor’s degree in Philosophy from Bard College, and a Master’s of Library and Information Science from Simmons College.